Our Creative Director Damien Parsonage, recently wrote of the need to harness emotional power in pharmaceutical marketing. 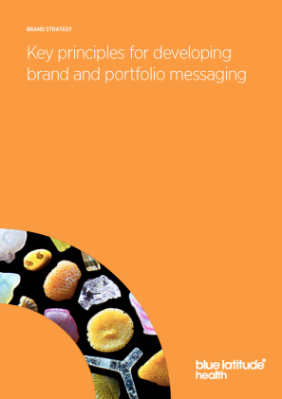 One of the key foundations on which a brand is built is a messaging strategy. The impact of strong messaging is visible across industries. At its highest level, it’s the reason we associate commonly used words with established brands. For example ‘just do it’ instantly brings the Nike swoosh to mind, and ‘I’m loving it’ the golden arches of McDonalds. It has enabled successful launches, repositioned established brands, and fended off competitive threats. For example, Lucozade is one of the largest carbonated softdrinks in the impulse and convenience sector. However, it has managed to avoid many of the negative, ‘unhealthy’ associations of the category through consistent messaging and gradual evolution from its 1927 message on provision of recovery from illness – ‘the nice part of being ill’.When working with healthcare brands, compliance restrictions add an extra layer of complexity to the brand messaging challenge. This doesn’t need to limit the impact of your messaging, and if anything, makes the role of a clear messaging strategy more important. In the type II diabetes market, the hugely successful launch of Lantus in 2000 is partially attributed to powerfully emotive messaging that focused on product benefits, helping to overcome the resistance to injectables earlier in the disease pathway. Here, we offer some guidance on developing messaging for your healthcare brands. Before you begin your brand messaging project, take a look at the practical checklist featured in the downloadable PDF version of this article, designed to help you map your aims, audience, product attributes and processes. At Blue Latitude Health, it’s often the role of the strategic consultant to pull the relevant information together to form an in-depth understanding of the market, the customer profile, and the business objectives before collaborating with a medical writer to advise on the therapy area and find unique angles to the story. Regardless of whether you’re partnering with an agency or consultancy, or creating messaging in-house, it’s essential to have clarity on these key points first. The first and foremost step to creating a brand story is to establish the brand proposition. This is the single-minded thought that all your messages aim to serve. The proposition can be an immediate patient benefit, such as having more freedom to experience life, or it can be an aspirational goal, such as reaching a cure. Everything you want to communicate about your brand should lead towards this one idea. Defining the brand proposition requires a lot of thought. There can be layers of complications such as having multiple business objectives, historical messaging that needs to be taken into account, anticipating pipeline products and avoiding conflicting messages with other brands in a portfolio. Working with a consultant and a medical writer can help you unravel some of the thinking and reach an optimal direction for the story. Typically, we recommend a house structure to categorise and clarify the hierarchy of information, but sometimes a story flow in prose or arranged in tables will do the job if the level of information is very simple. Whatever form it takes, the brand story must have a beginning, middle, and end, each serving to connect with the other. The beginning is especially important because it’s a point at which your audience will choose whether or not to engage. People are motivated by ‘why’, more than ‘what’, so it’s worth paying more attention here to getting it right. The main body of messages should then act to address the opening and lead to a call to action, tying it up with the proposition. If at any point you’ve had to reread the copy to understand the flow or logic, it’s an indication there is a missing link within the story. A feature can easily be mistaken for a benefit. Pharmaceutical products can have many important features that feel like benefits – symptom control, life extension, reduced pill burden, improved tolerability – to name a few. When developing brand messaging, it’s important to go one step further to communicate what these features might mean to a customer. This could be the ability for their patients to get on with daily life, a chance to spend more time with loved ones, or the capacity to return to work. Of course, the messages must be balanced and not misleading. Having a balance of commercial and medical mind sets in your team will help you achieve a brand story that is both compelling and compliant.